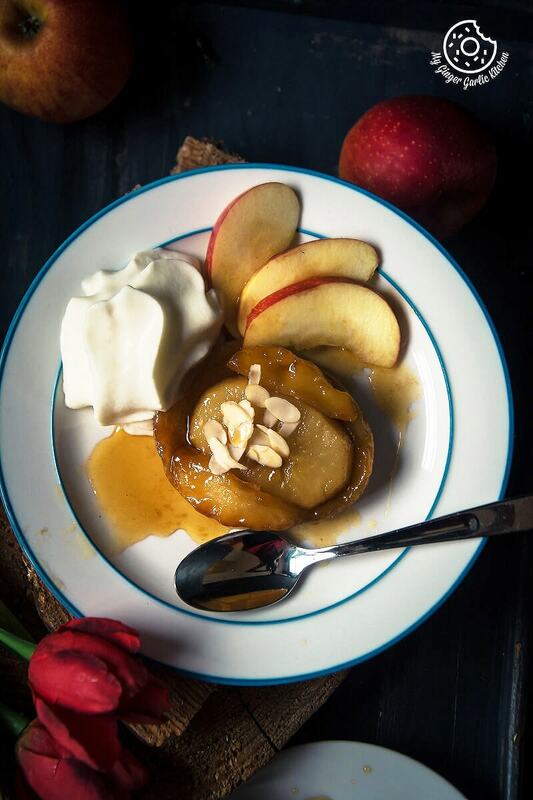 Mini Apple Pear Tarte Tatin — A classic, delightful looking and easy to make miniature bite sized version of a divine French dessert. The aroma, the texture, the flavor, and color is mind-boggling. 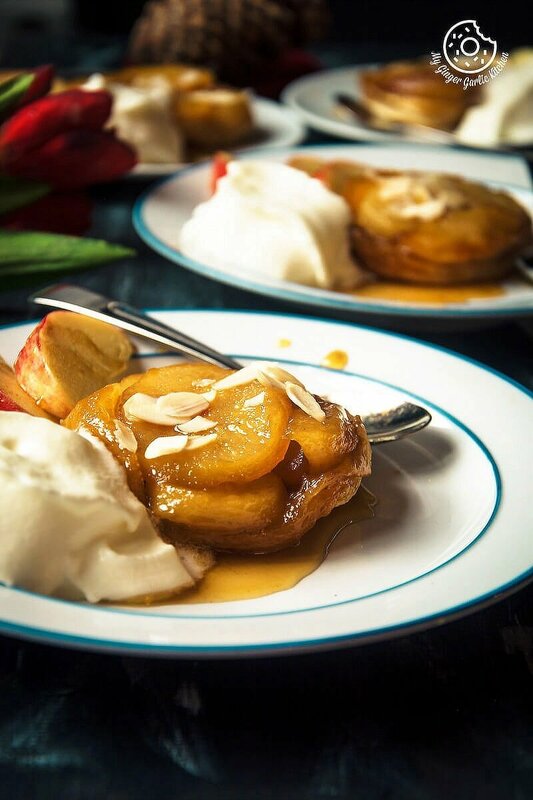 These Mini Apple Pear Tarte Tatin are a dessert made into perfection. Classics are always the best and when it comes to French food there’s no substitute for classics. Be it the name of the dish, serving portion, or cooking style — everything is just so elegant and delicate in French desserts. Don’t you agree? And Tarte Tatin is one of such desserts which can never go out of style. 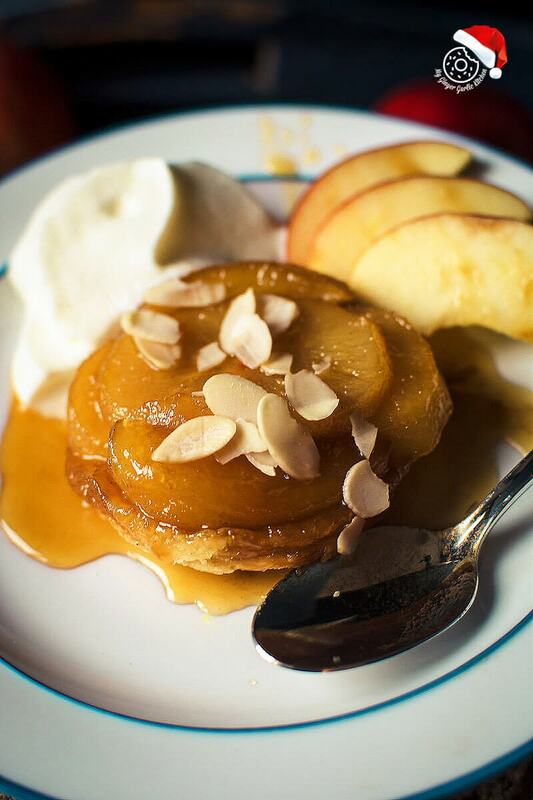 Many of you will be familiar with the traditional Tarte Tatin. Just in case someone doesn’t know, here is a little intro. 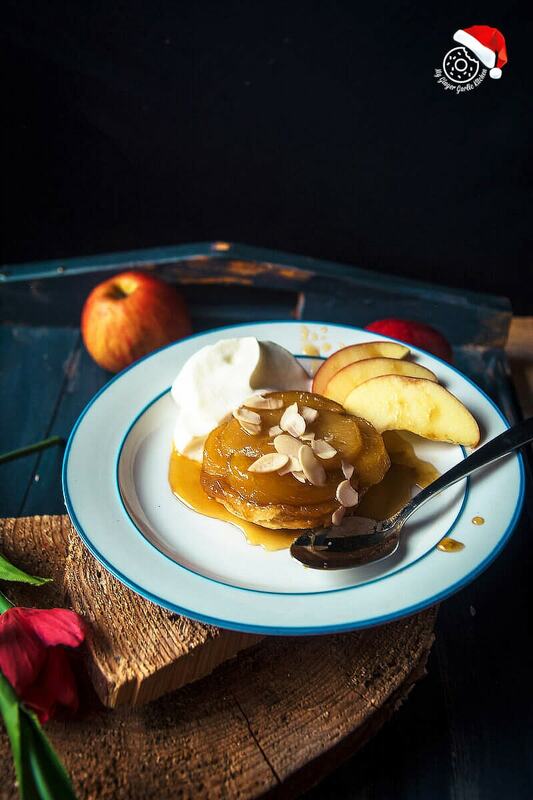 Tarte Tatin is a very old and traditional French recipe where fruits are cooked in sticky caramel mixture and then covered with deliciously crisp pastry sheet and then finally baked in the oven for the final touch. The aroma, the texture, the flavor, and color is mind-boggling. Do your think I am exaggerating? Whatever you say, the taste of a rustic mini tart fresh out from the oven is so scrumptious. Another good thing about this sophisticated dessert is that making this dessert is extremely simple. Easy to assemble and the end rewards are awesome. Plus, they are mini and super cute too. I love them in all ways. Holiday feeling and Tarte Tatin are similar in a way. 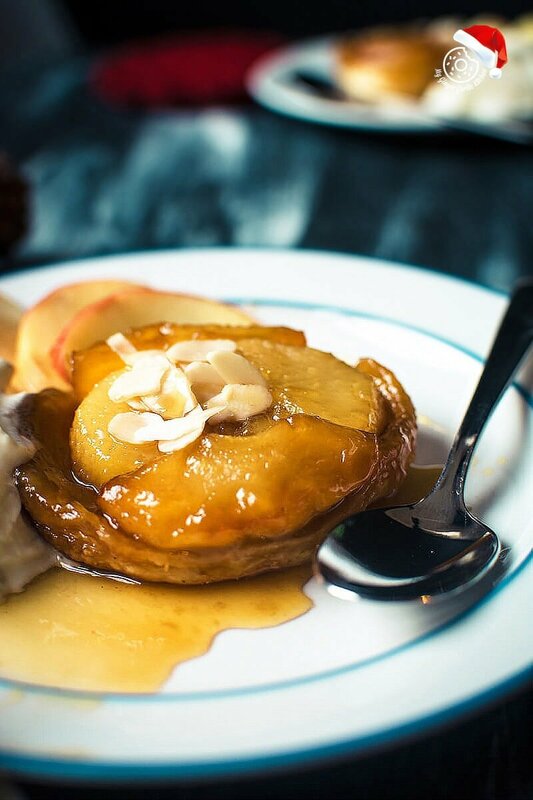 Words simply cannot describe how we feel about holidays and this feeling is about the same with these Mini Apple Pear Tarte Tatin. Just so yum! 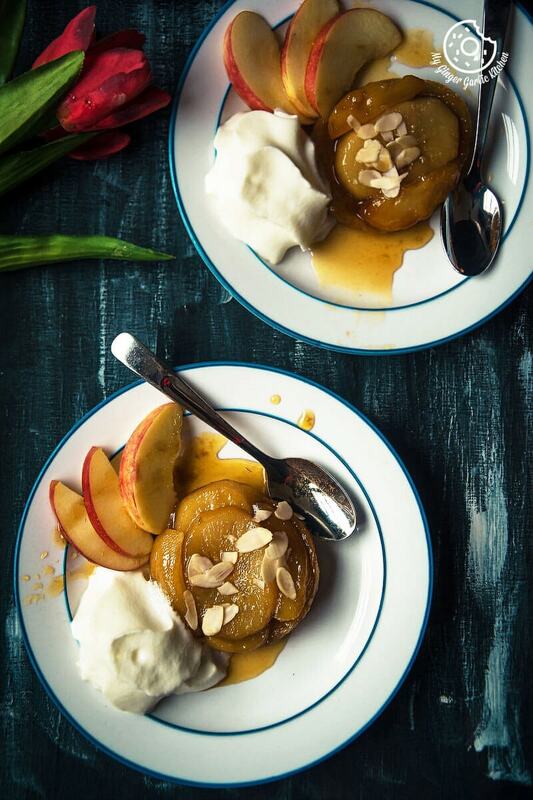 Seriously, these Tarte Tatins are absolutely delicious. I am not French, although I wish I was, so I am not sure about the validity of the stories I have read on the web over the years. Many say that Tatin was a fortuitous invention in French culinary world. The Tatin sisters, who are said to have invented them, ran a restaurant in France. One day one of them was tired after a long day of work and she had to make an apple pie, but she was so tired that couldn’t focus on cooking and accidentally she overcooked the apples in butter and sugar. She was in a hurry to serve to the customers, so she covered those apples with a pastry sheet lying nearby, and then she put the whole pan in the oven. Then the sisters served that dish as an upside down Tarte to their customers and soon after that, this Tarte became a sensation. That was the birth story of Tarte Tatin. 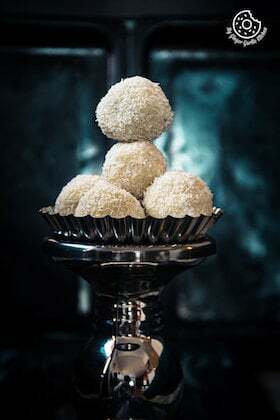 Holidays are approaching and we are in a need of some nice dessert ideas. 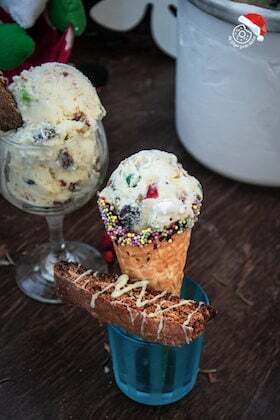 For me, bite sized individual desserts sound more fun than serving a cake or pie. Beautiful little dessert bites of perfection — that’s what these Tatins are. My love for these:I hope you guys already know about my love for puff pastry. I have wrote here, here, here and here. I LOVE ’EM. Also, I love using mini dishes, so I often make my food in mini cocottes, they are like the paragon of adorableness. I made these Mini Apple Pear Tarte Tatins in mini cocottes, but you can use any tart dishes or ramekins. Serve these individual desserts topped with some caramel mixture and sliced almonds. Whipped cream and some apples would be a nice addition too. 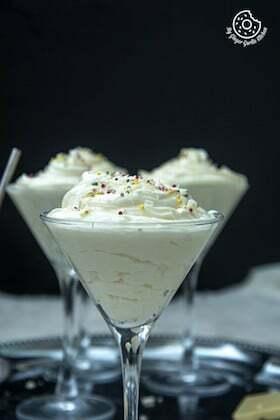 You can even serve them with some vanilla or caramel ice-cream. 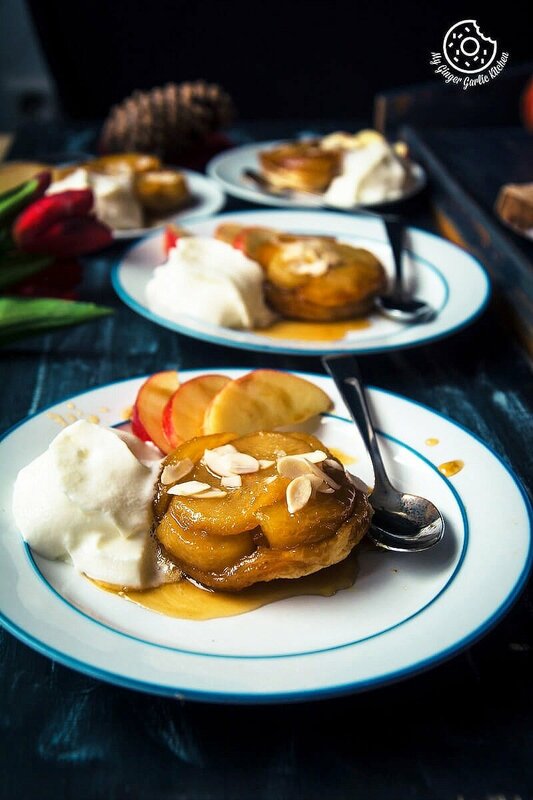 These Mini Apple Pear Tarte Tatin are a dessert made into perfection. Peel and core the apples and pears. Slice each apple into thick slices and pear into 6-7 equal-sized lobes. Set them aside. Heat a skillet over medium-low heat and add sugar in an even layer. Stir continuously. Many people don't stir the sugar and they let it melt without stirring, but I personally find the stirring prevents it from burning. When the sugar is melted and golden brown, add salt, butter, and lemon juice. Stir well until butter is melted and incorporated well. Add sliced apples and pear lobes. Cook the apples and pears in the caramel sauce. Flip them once they are cooked on one side. Continue cooking apples and pears until soften and caramel begins to brown. It would take 8-10 minutes. At this stage, it will thicken to the consistency of maple syrup. Cut out the pastry sheets into circles. Place crust on top of apples and pears and tuck in edges around apples and pears. Make few slashes with a knife. Bake in the 200°C preheated the oven for 15-20 minutes or until crust is golden brown. Remove from the oven and slightly press with the bottom of any glass. Allow them to cool for 5 minutes. Place a plate over the top of the pan and carefully invert to release tarte from the pan. Scrape if any remaining fruits stuck to the cocotte. Drizzle with reserved caramel sauce. Top with almond slices. Server along with apple wedges and whipped cream or ice cream. Enjoy.